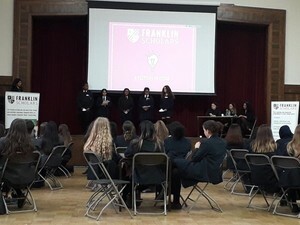 Last week, Copthall School hosted the Franklin Scholars ‘Festival of Ideas’. Franklin Scholars is a national organisation which sets up mentoring programmes in schools where outstanding Year 10 student leaders help younger students in their school through peer tutoring and mentoring. Copthall welcomed Year 10 students from a number of schools including Mill Hill School, Whitefields, St Clement Danes and the Reach Free School. Students undertook a variety of tasks; planning a social action project, a public-speaking workshop and a team-building exercise involving marshmallows and spaghetti. The second half of the Festival saw teams pitted against each other in a Dragon’s Den style competition. Ideas pitched ranged from providing ICT support for the elderly to recycling to improve the environment. The final decision was down to a team of ‘Dragons’ which included our own Head teacher, Mrs Forde. St Clement Danes school won and a Copthall team came second, winning £120 to work on an idea to encourage girls’ involvement in STEM subjects. There was a fantastic buzz and energy throughout the day and all the young people involved further developed their confidence and communication skills. A heartfelt thank you for Copthall's contribution to making the Festival of Ideas a resounding success. We so appreciated you hosting the event and the Copthall Scholars were excellent ambassadors for your school, demonstrating impressive creativity, collaboration and application. They said their favourite parts of the day were the airplane crash simulator task and pitching their ideas to the "dragons". 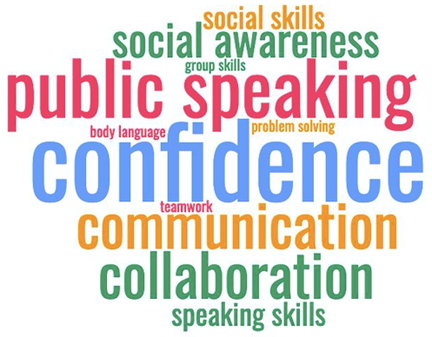 71% of students said they feel more confident talking to new people. The skills and habits your students felt they had developed at the Festival of Ideas.